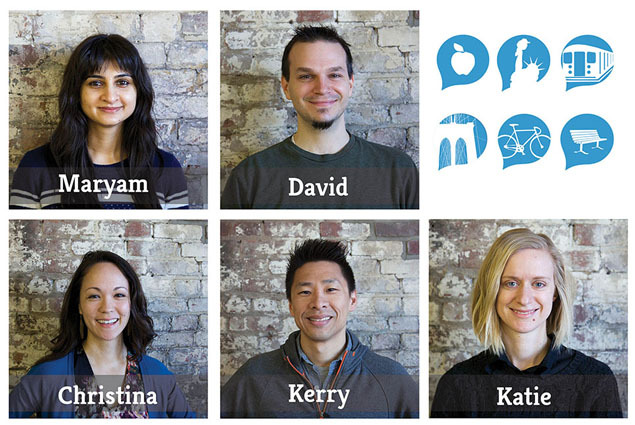 Springtime is growing season: Meet our new team! 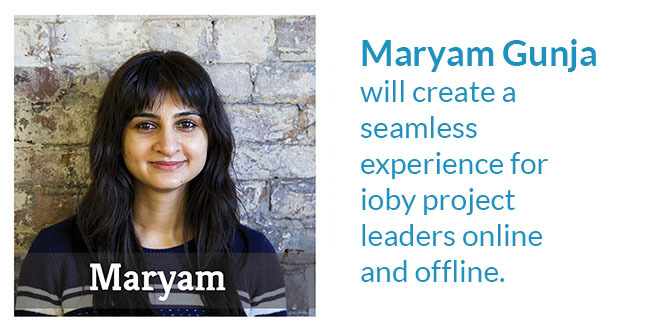 We are thrilled to announce the arrival of FIVE new ioby team members here in our Brooklyn HQ! Spring is here and we’re gearing up for a huge year at ioby as we overhaul our online platform, launch an exciting batch of new partnerships, and do our groundwork for outreach in several more cities. As our new team gets settled, we’d like to take a moment to introduce them! Under her bed, Maryam keeps a collection of unfinished written vignettes, which she peeks through regularly in her free time. They’re portraits of inanimate objects, mostly foods, and haven’t settled into any particular genre, yet. On weekends she can be found running loops in Prospect Park’s interior, sleeping through a low-budget dystopian film, or hanging out with her niece. When the mood strikes, she ventures into creative recycling, collaging with unsolicited mail, glass waste, and those pesky clam-shell take out containers. David Palmer knows computers, and he knows software, and he’s insatiably curious. Lucky for us, he’s here to sick that curiosity on our website and platform. 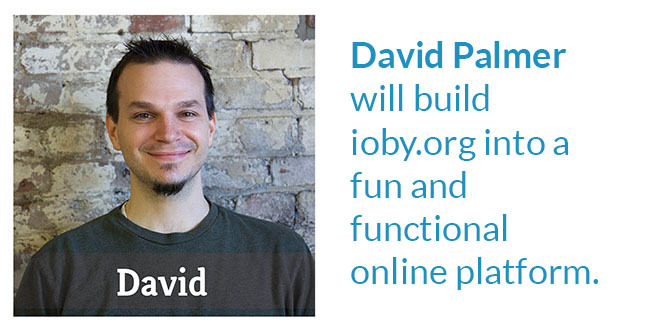 What his LinkedIn profile won’t tell you is that David is also a singer, guitarist, and songwriter. One of his fondest early memories is of making up songs during long car trips with his family – a tradition he keeps alive and well today, by composing kids’ songs with his own son, Donovan. He wants his songs to invite listeners to experience a world in which children are no less powerful or autonomous than the rest of us. When he’s not jamming with Donovan, working in his community garden, or biking with his family, David can be found singing with the University Glee Club of NYC. A freshman in the all-male group, he’s already plotting his first big ask: that their director of music assign the choir David’s favorite choral piece, Ubi Caritas Et Amor, an ancient Gregorian plainchant melody. Christina’s got both feet on the pavement, and she’s ready to go. She’s sold off her car, packed up her marketing experience, and joined us from the gorgeous mountains of Phoenix, Arizona – and she couldn’t be more excited to start calling Brooklyn home. In fact, please immediately direct her (seriously) to your favorite local restaurant or hole-in-the-wall antique shop. She loves good food and flea markets – “neat little old things” – and she’s all ears. Has city boots, will travel. She’s also a born ioby-er. Back in Arizona these past few years, Christina had very organically found herself dabbling in exactly the type of community building that’s our bread and butter. “I’d lived in the same neighborhood for 15 years,” she explains, “and until the last couple years, we all drove into our driveways and into our garages and never really said anything to each other. We’d lived by these people for over a decade.” So Christina and her sisters decided they were going to get to know the neighbors, starting with a series of community block parties. Street games, a basketball hoop, cards, a little BBQ. Nothing crazy. Everyone would watch the sun go down, and just chat. But it really brought the neighborhood together, and got Christina fired up to do more. In her free time, Christina loves to read, jog through Prospect Park, and cook. Her sister jokes that if you think you don’t have a meal in the fridge, you should invite Christina over. She also does a lot of collecting of art supplies, and is thinking about starting to maybe also use them. Maybe. What’ll she make first? Probably a mess, she says. A yogi, meditator, theater buff and social justice nerd, Kerry comes to us from the intersection of the arts and social impact worlds. With over ten years in the cultural sector, Kerry is always thinking about how local projects – especially in the arts – can move hearts and minds towards connection and empathy. He sees the creative process as a container for social engagement. A place where the ideas we hold about each other can intersect and transform. Prior to ioby, Kerry led operations at BRIC, managing various projects that led to the opening of BRIC House in Ft. Greene, Brooklyn. Kerry is eager to bring that experience to ioby. In particular, he is excited to dive into ioby’s non-hierarchical approach to organizational management, and to figure out how transparency, equity, and inclusion can scale up as the organization grows. Outside of work, Kerry is usually at a performance, doing yoga, or in a meditation workshop. His environmental obsession is waste, all kinds of waste (yup, even that kind). Kerry has been known to sort (okay, re-sort) his housemates’ trash for recyclables and to hack his toilet to reduce water flow, with mixed results. He’s stoked for the city’s experiment in curbside composting to hit Prospect Heights, where he lives. Meantime, he’s considering smuggling his food scraps into work to add to the Bokashi compost bins in ioby’s Brooklyn Creative League office, in Gowanus. Waste zero is the future, and the future starts now! 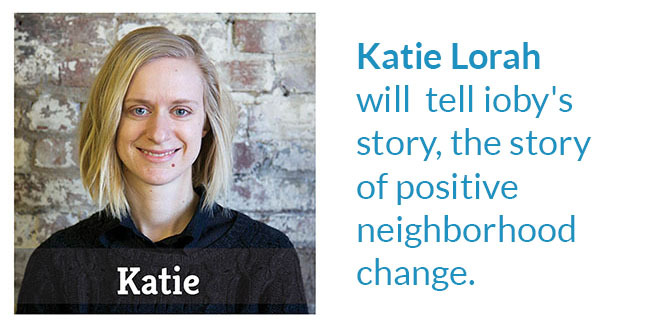 When she’s not dreaming up ways to turn superfund sites into community spaces, Katie’s often headed out of the city in search of good hiking, backpacking, snowshoeing, and the like. She once hiked the entire Pacific Crest Trail from Mexico to Canada, and she is still a pretty fast walker. She can also make a respectable camping stove out of a beer can. Certainly feels like a prosperous year coming!